Regret or remorse, what's worse? An age-old problem and a very personal interpretation of life. Not that Mr Tapinois had much choice as he got tangled, against his will, in a really big mess: he killed the housekeeper by mistake, while he was training for a duel. Remorse therefore, and sense of guilt, get hold of the almost-young, almost-robust, almost-interesting and, above all, single Mr Tapinois! 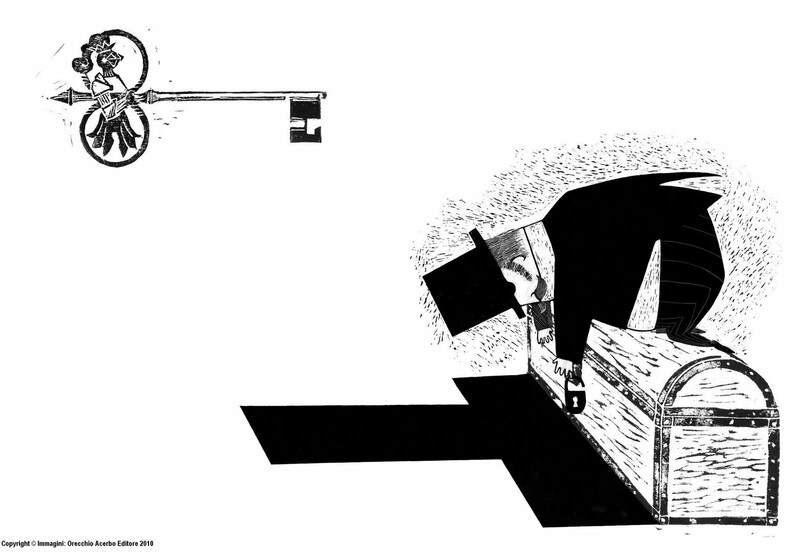 This is the start of the new picture book, part of the collection Lampi, by Orecchio Acerbo. Is this a detective story? Not really. A Thriller then? Almost... Maybe a Surreal story is a better description, with a touch of humour noir, a pinch of grotesque and much irony. If these ingredients whet your fantasy then, from tomorrow, you can go at your bookshop and buy it! 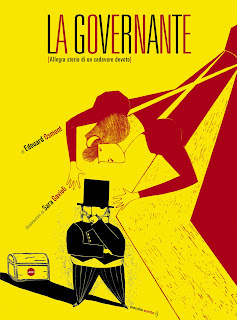 La Governante is a perfect picture book for these days of suffocating hot: it'll freeze blood in your veins for an absolutely moderate price.... Now why don't we analyse together this beautiful volume? For this I shall have to use a more convenient tone though! First of all two words about the author, whose ghost seems to have haunted the poor publishers until they were finally forced to produce the book! Edouard Osmont, a.k.a. Blaise Petitveau, has become a ghostwriter of French literature between the end of the 19th and the beginning of the 20th century. About him we only know that he was a frequent visitor of Le Chat Noir, in Montmartre, together with a large group of artists and writers amid whom we find as well Alphonse Allais; we know as well that he contributed to magazines such as Le Rire, Le Sourire and Fantasio to which, amid others, were collaborating as well Henri de Toulouse-Lautrec (another well-known habitué of Le Chat Noir) and Pierre Henri Cami (another incredible writer, not a renowned one neither, even if he's more known than Osmont. Years ago, the publisher Sellerio, had printed his irreverent Avventure di Loufock Holmès**, a clear parody of Sherlock Holmes). Osmont therefore remains an enigmatic character, wind up in a mysterious aura and, up to today in a thick web weft as well. Luckily enough for us, Fausta and Simone have decided to remove this last one. From a veiled hint to absurd, though maintaining an elegant balance with reality, Osmont reaches the most paradoxical and unrestrained tones of absurdity. Well, I won't be the one who gives away the end of the book! 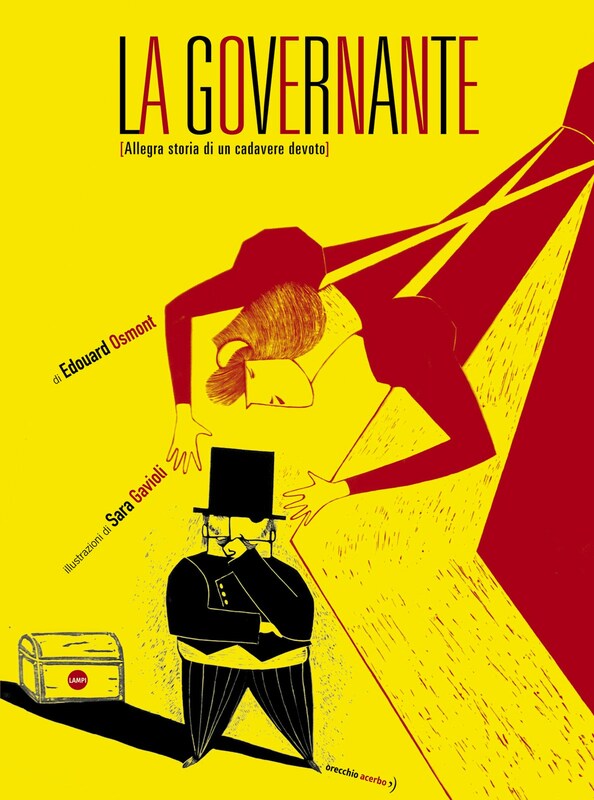 The illustrations, by Sara Gavioli, are beautiful: edited with extreme care, always fitting, with a taste for retrò that marries well the text they refer to, and though they're always relevant. The enormous research Sara has made to obtain such a result is clear: we can see it surfacing in details, in unusual framings, in the careful décor. I'm thinking for instance of the pendulum clock, of the playing cards where she hides little information, of the use of silhouettes and the skilful handling of shadows. What else could I say? Once again an audacious choice made by Orecchio Acerbo, a cultured, singular one, that goes against the tide. Once again my personal thanks go to Fausta and Simone for the excellence they keep bringing to our attention. * La Governante means the housekeeper. ** Avventure di Loufock Holmès means Adventures of Loufock Holmès.